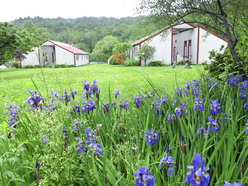 Study and practice permaculture design at the Sowing Solutions Permaculture Community Hub, along Salmon Falls and the Bridge of Flowers in the Village of Shelburne Falls. This brief video is made by Emmett Brennan, one of our course graduates ~ He is one of the filmmakers who created the film 'Inhabit, A Permaculture Perspective'!!!! The permaculture course is a training for people of all ages who are interested in designing their own home and community landscapes so that they are abundant, healthy, diverse, and contribute to a beneficial legacy for the future. During the course we share extensive resources about creating landscapes and habitats that grow medicine, food, building products, etc, and that are also capable of sequestering carbon so that carbon returns back to our soil and our living earth systems where it belongs, rather than in the atmosphere. Our teaching staff is a team of leading professional designers and educators from the northeastern USA. The students who attend our program are typically between the ages of 17 and 80+, and the experience and background of each person contributes a unique perspective to the learning group that we form over the three weekends. This permaculture course is an educational event full of information sharing, skill-sharing, hands-on learning, and empowerment. These skills of permaculture are one effective way that we can act on behalf of this ecosystem and home that we call Earth. Visit Western MA Permaculture Demonstration Sites: Studying permaculture while visiting permaculture homes, homesteads, a world-renowned ecovillage, and local farm sites offers you a chance to witness existing and proven permaculture strategies and techniques. You'll learn first hand about: four-season greenhouses, naturally built homes, forest gardens, annual & perennial raised bed vegetable gardens, community decision making, conflict resolution practices, food storage, renewable energy systems, soil improvement, compost strategies, waste recycling, and more! Our permaculture course offers you an opportunity to observe & evaluate numerous well-established permaculture systems, and learn from them. A Permaculture Design Certificate signifies that one has completed a 72 hour design course, a study of the ethics, principles, and design practice of Permaculture. It means the holder of the certificate holds applied permaculture experience and a profound toolbox of permaculture techniques, strategies, solutions, resources, and skills. We offer extensive design time and practice, as well as skill shares. In this course you may be: mapping, working with solar light reading tools, sheet mulching, preserving and fermenting food, mixing earth plaster, designing a forest garden guild, making oxygenated compost tea, preparing herbal medicine, tending to a masonry stove or cob oven, etc. During class time we will integrate the methods of storytelling, slide shows, films, discussions, hands-on design activities, etc. During breaks are yoga classes, meditations, dancing, hiking trails, permaculture films, etc. Our course qualifies for 3 or 4 college credits from UMASS Amherst, available to all students who are enrolled in the 5 College Consortium. Watch this introductory video about our course ~ This brief video is made by Emmett Brennan, one of our course graduates ~ He is one of the filmmakers who created the film 'Inhabit, A Permaculture Perspective'!!! !